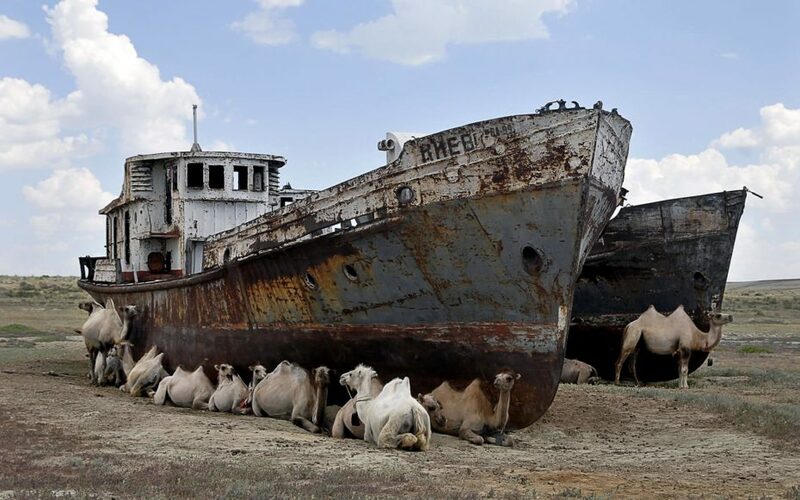 Only 30 years ago, this was home to our planet’s 4th largest inland water mass; an ancient sea so vast, even Alexander the Great wrote of his struggles to cross it; where fishing commerce boomed and holidaymakers once flocked to its seaside spa town. 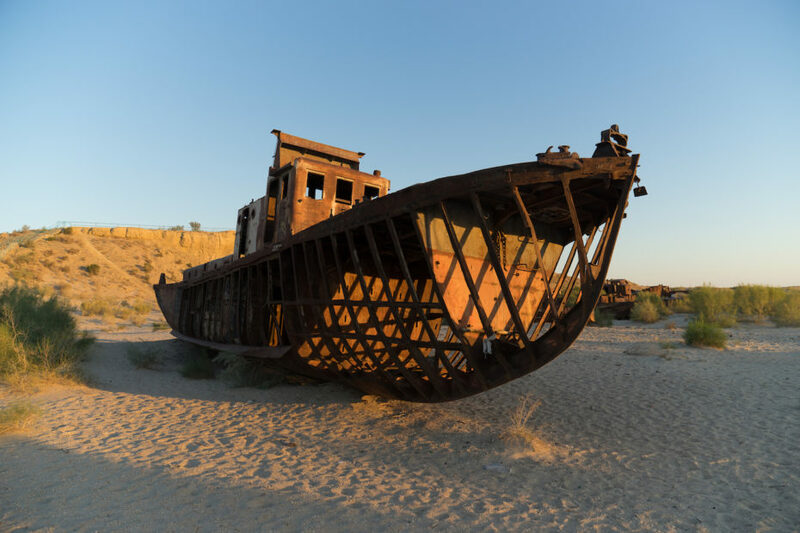 Now, for the first time in 600 years, the Aral Sea is (almost) bone dry, and the fleet of giant, rusted ships left in its wake have become some of the only proof of the past. 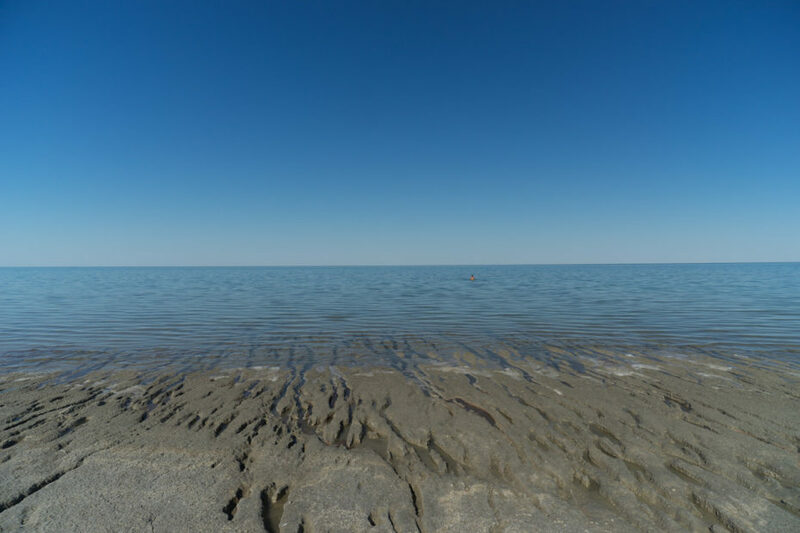 But first –– wondering where the heck this massive sea is situated? 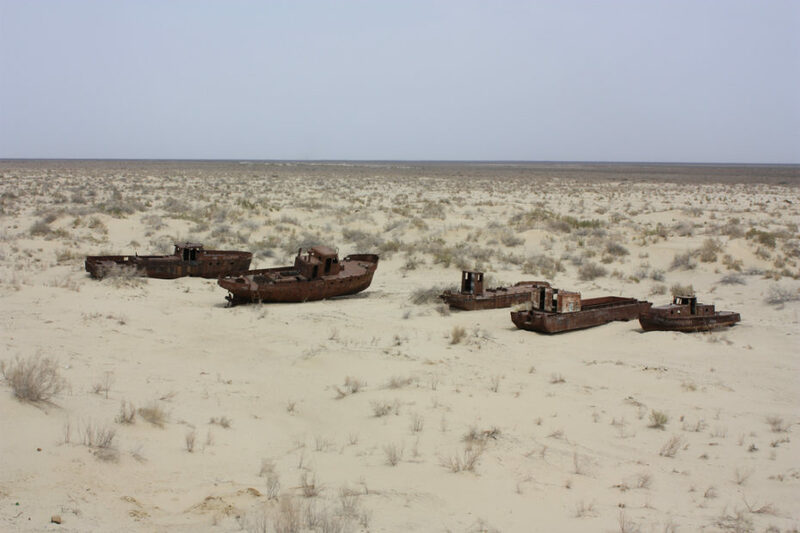 The Aral Sea is (or was) so large, it spreads over two Eurasian countries that now straddle its dusty remains: Uzbekistan and Kazakhstan. And if we rewind the clock back a few decades, both countries were under the imposing rule of the Soviet Union. 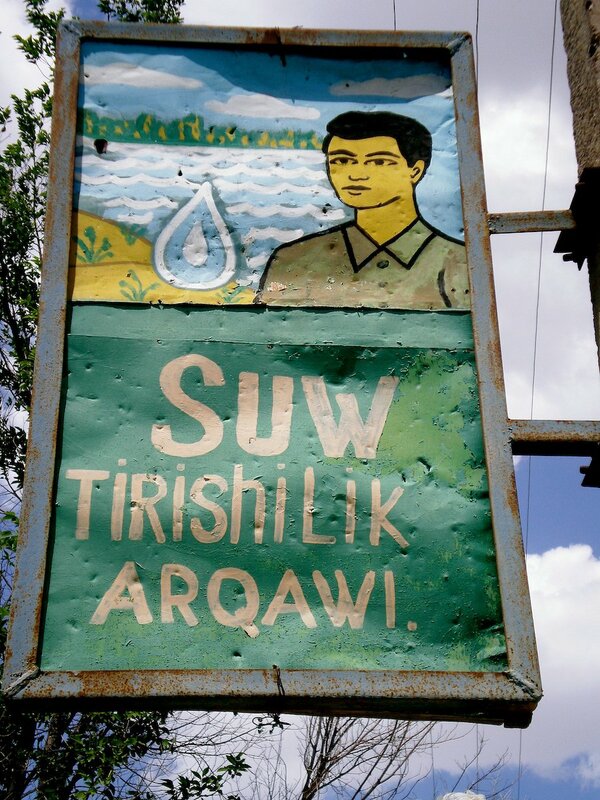 In the 1960s, the Soviet Union decided to implement a huge agricultural irrigation project to feed into their cotton industry in the area, diverting some major rivers that fed its water supply. It was relatively smooth sailing until 1975. Then, things got weird. The fish got sick, and so did the fisherman. The salt content was so high in the water, that in coming decades it became impossible to take a dip without being covered in a white film. The Sea in 1977 (left) and in 2019. 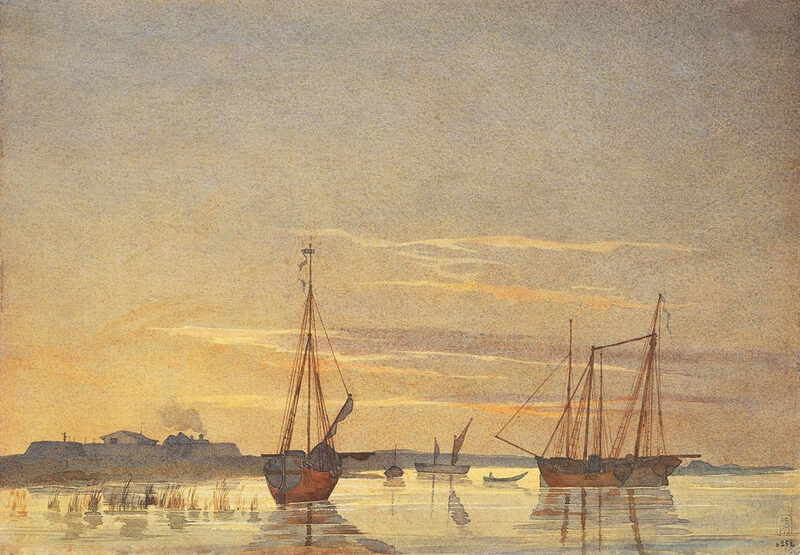 Fishermen used to catch hundreds of fish a day in the sea. Today, those stories must sound like tall-tales to the younger generation of locals who live in the floundering villages on the edge of what looks like a desert. Imagine if, in the blink of an eye, all Lake Michigan disappeared. 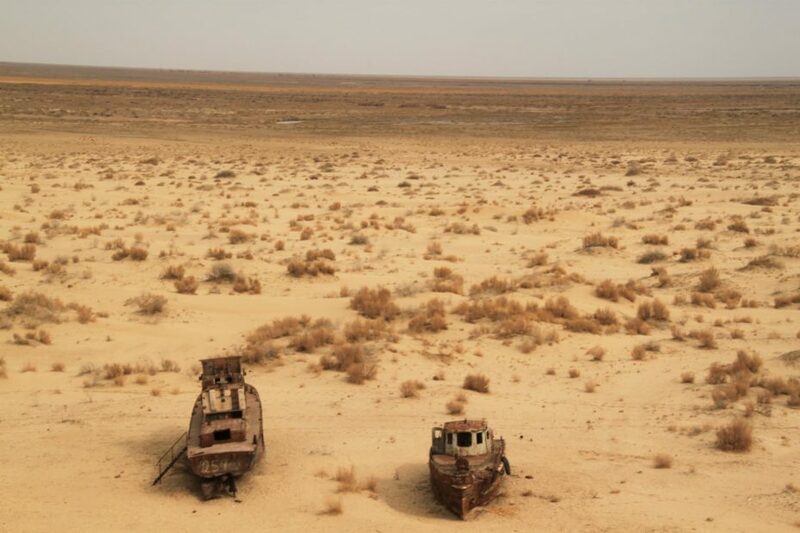 Thus, a ghostly ship graveyard began to form. 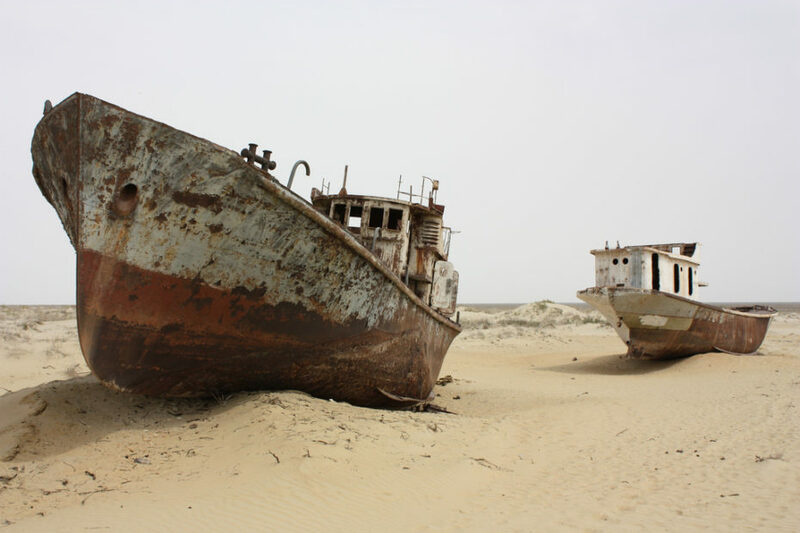 With it, came an unexpected surge of “dark tourists”; those curious to see this mysterious sea, and poke around the abandoned ships where camels now find shade, and graffiti artists, a canvas. “Save the Sea” is painted on one ship, a mermaid on another. 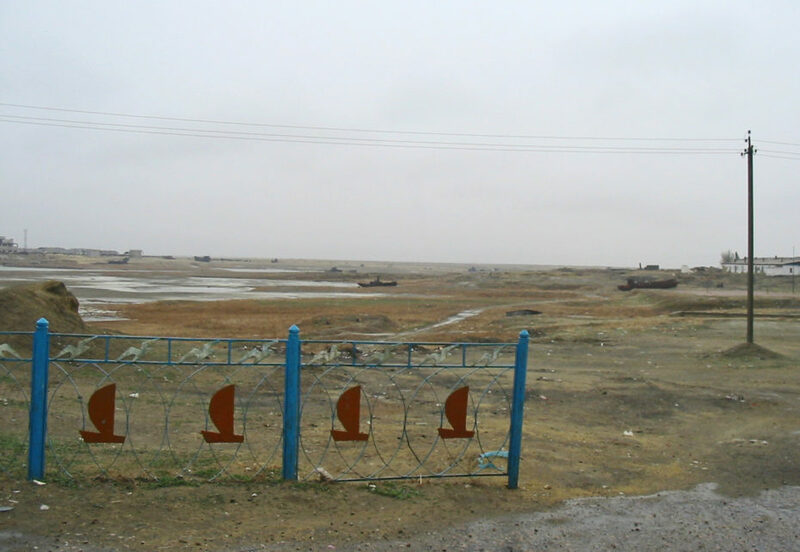 But why divert so, so much water – enough to irrigate about two million hectares (5,000,000 acres) – in the first place? Well, once upon a time, Tsarist Russia was heavily dependent on the United States for its supply of cotton. When that supply was cut short after the American Civil War, the Soviet Union had to create its own cotton industry. 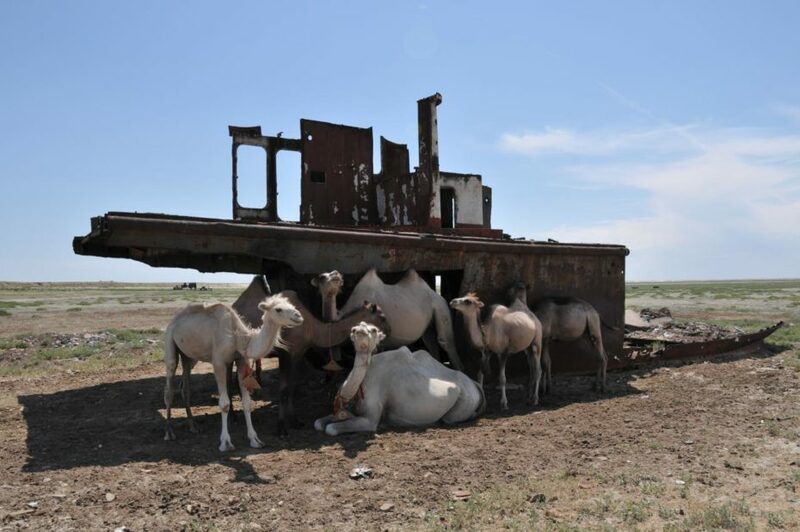 To this day, the areas around the Aral Sea are still world leaders in cotton production as a result of that shift. In that sense, the Soviets achieved their goal. 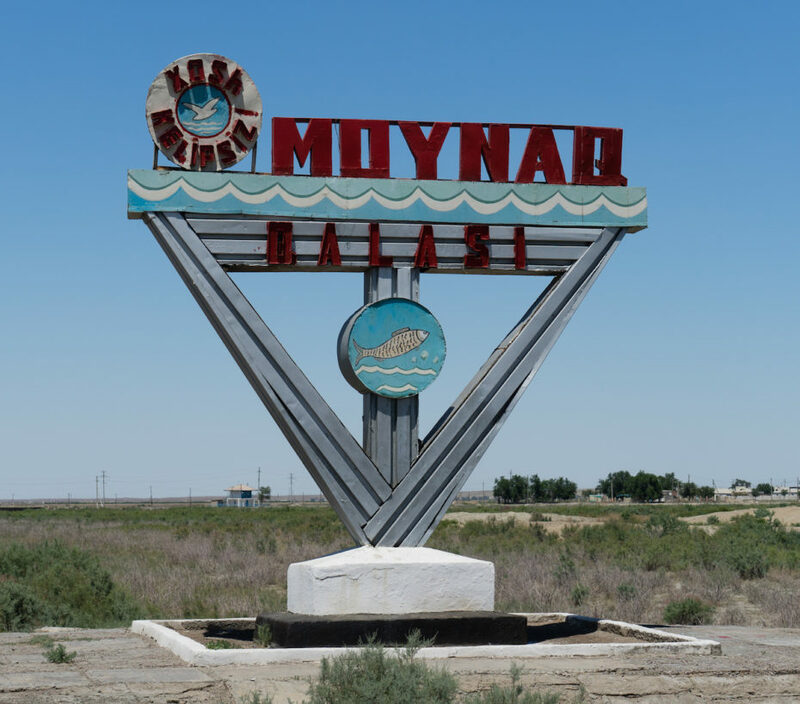 Remnants still remain of that Soviet influence, from the token statue of Lenin in practically every village, to fading scythe symbols on crumbling buildings. Brave “tourists” will dip their toes, and bodies if they can, in areas where water remains – perhaps without knowledge of the pesticides and other chemicals that linger. 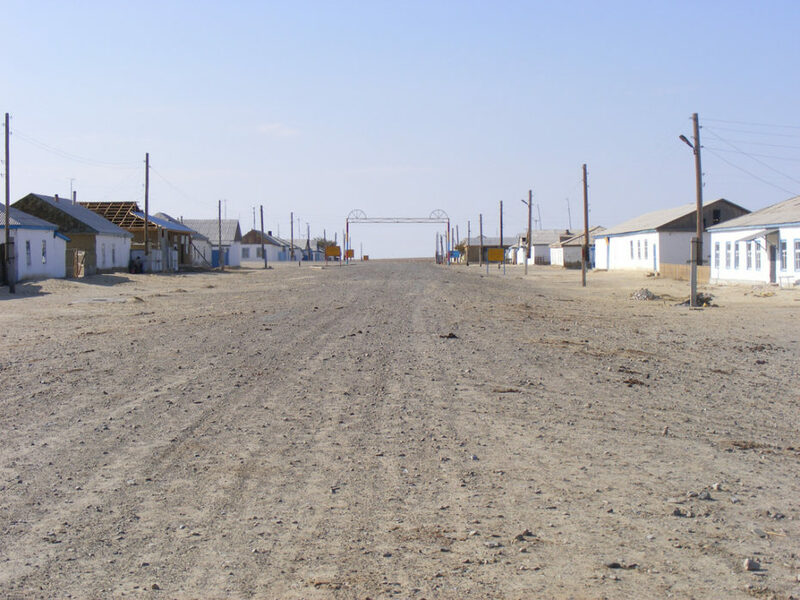 Being remote, the surrounding regions were also a prime spot for Soviet biochemical testing, where variations of anthrax were produced amongst other mystery chemicals. 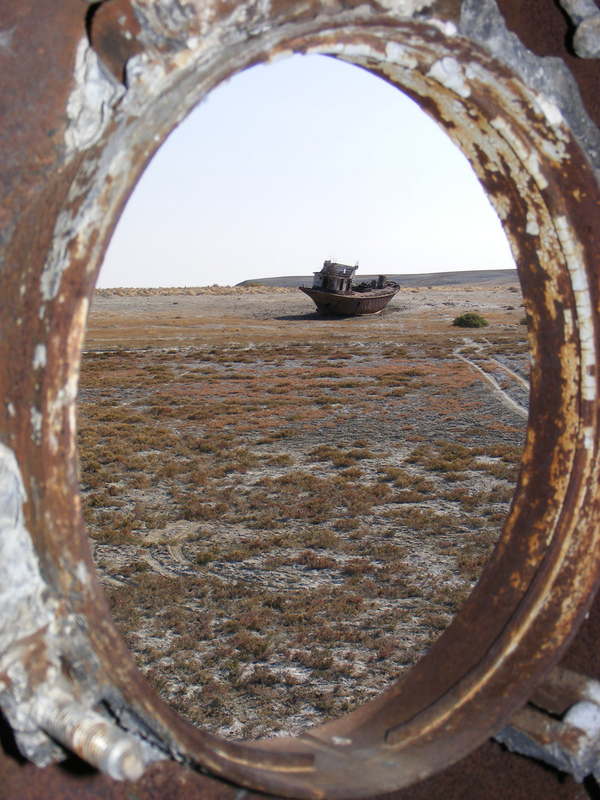 Yes, the Soviets really had catastrophic environmental mismanagement down to a science and the Aral Sea is kind of a silent petri dish of death. Aral (which roughly translates to “Sea of Islands”) refers to the hundreds upon hundreds of islands that once dotted its waters. The area also used to grow fruit, clover, and barley for cattle. Today, the solution isn’t as simple as redirecting the majors rivers back to its basin: it would now drastically harm the lives of the new farming communities that have since formed. The Soviet Union didn’t even deny their plans to devastate the area, which they rebranded as a “repurposing” of a random sea. As Geographer Christopher White explains in a 2018 science podcast, it was a very Stalinistic logic. 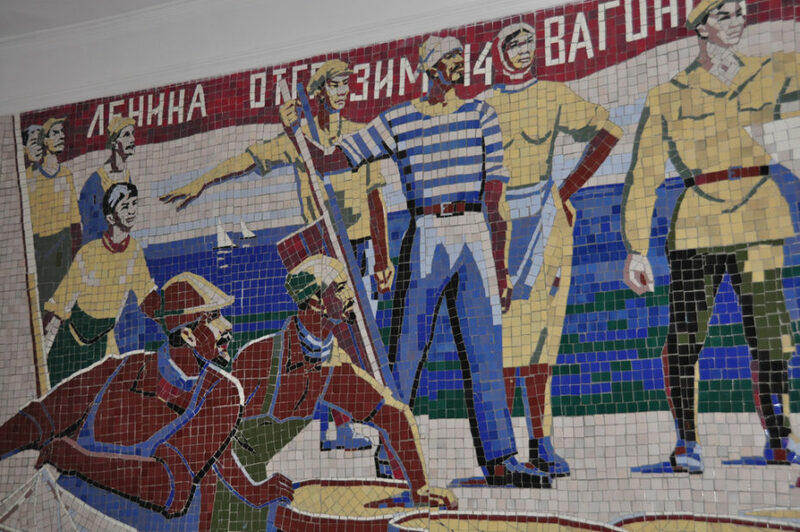 “The Soviet Union had plenty other supplies for fish,” he says. Not, however, for cotton. 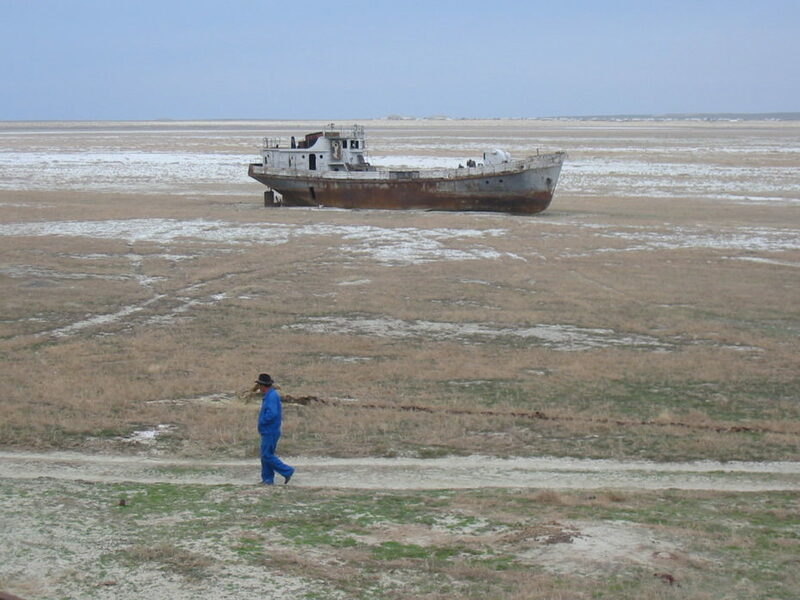 “They said it was ridiculous that such a sea should exist in central Asia in the first place.” By the 1990s, it was down to 10% of its original size. But locals aren’t giving up. Almost every investigative, on-the-ground piece of press you’ll read on the sea features families who’ve been there for generations and are fighting for the sea to bounce back. 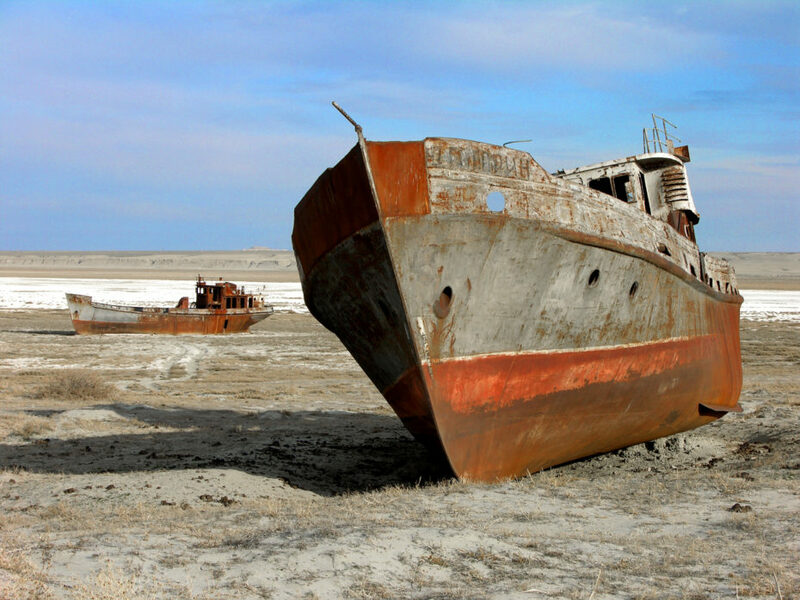 Twenty five years ago, the five states of Central Asia first created the International Fund for Saving the Aral Sea (IFAS). 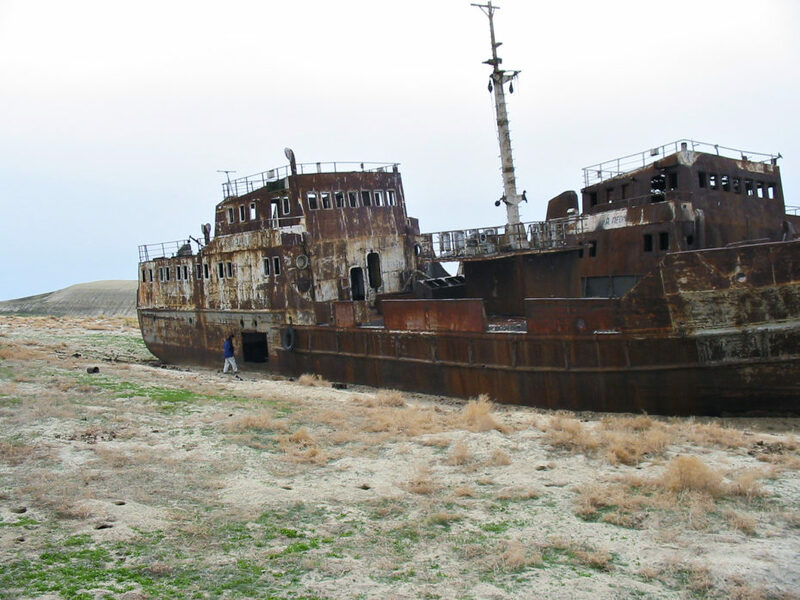 More recently, an Uzbeki DJ decided to launch an electronic music festival à la Burning Man held at the Moynaq Ship Graveyard. “The hypnotic and harmonic sounds will be directed towards the lost sea, with the DJs echoing the rainmakers who were once part of the region’s nomadic tribes.” The first event took place in 2018, and if you’re interested in attending the next one, you can start with the Stihia festival website. 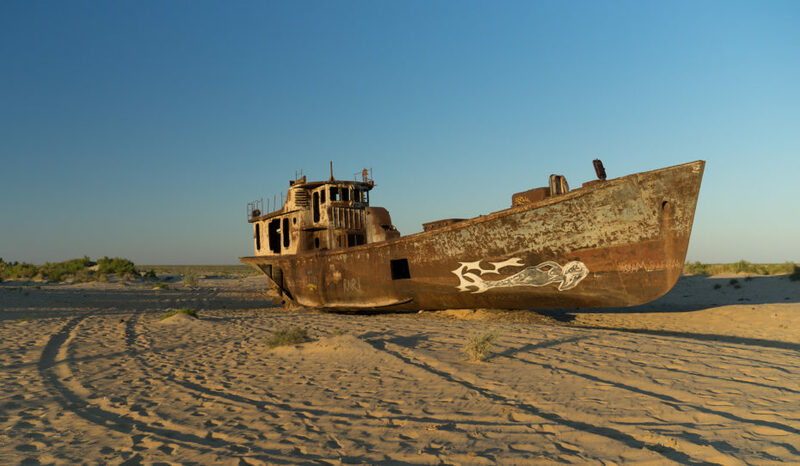 Most importantly, in 2000, UNESCO presented a 25-year plan to restore the region’s water, and in 2005, the World Bank partially financed a dyke and the semi-rechanneling of a river to the North Aral Sea. Today water is quietly trickling back into what’s now being called the North and South Aral Seas, currently home to two-dozen species of fish. A testament to the old adage: Life finds a way.